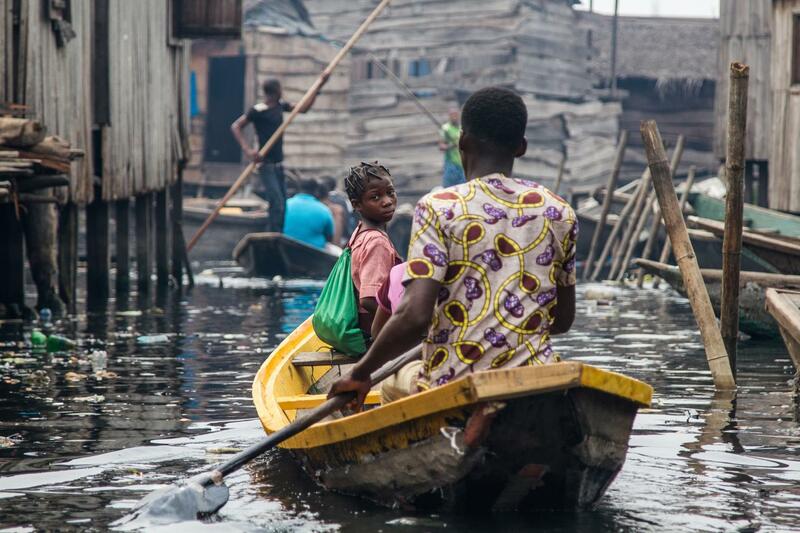 The waterfronts of Lagos are under constant threat of eviction due to skyrocketing land prices and rising population. 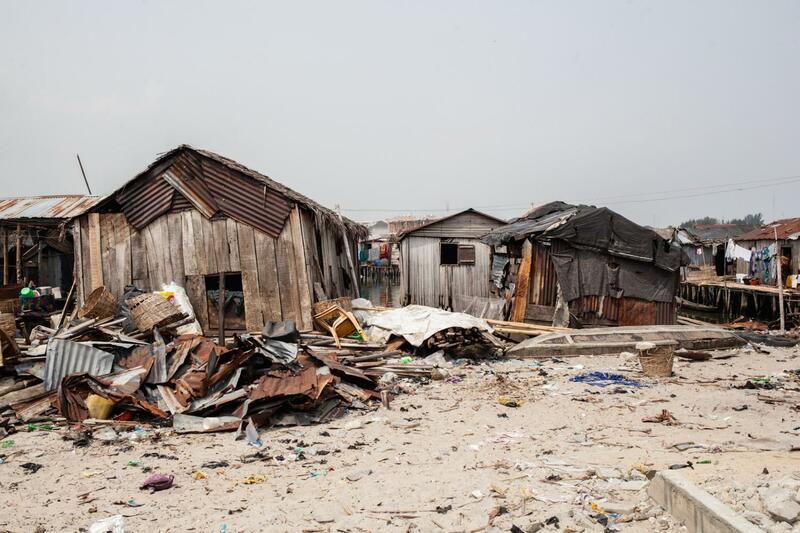 In Lagos, an estimated two thirds of the city's 23 million inhabitants live in informal settlements, where a lack of security of tenure is a defining characteristic. Without it, residents live in constant fear of eviction. 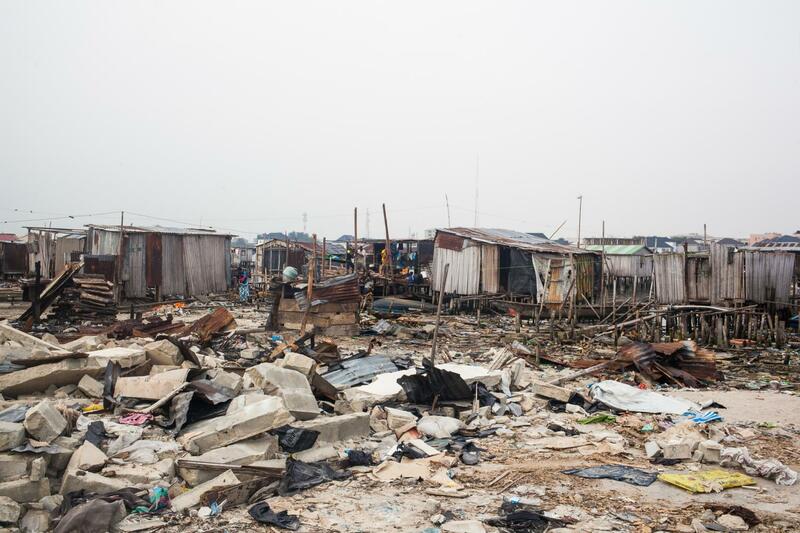 Skyrocketing growth has led to conflicts over land, often resulting in violent attacks on the poor communities and a continued threat of mass evicitons of the urban poor across the city. 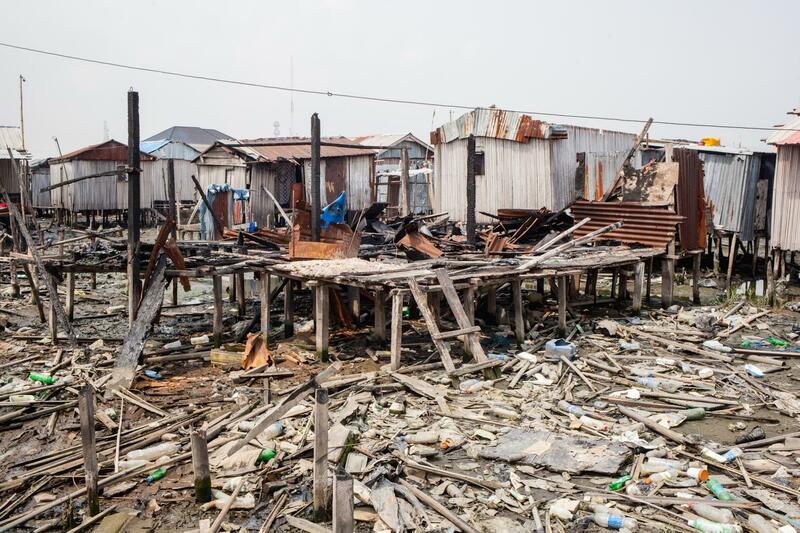 In November 2016, more than 30,000 residents lost their homes when they were forcibly evicted from their fishing community of Otodo Gbame. Eyewitness told how the community was set ablaze and the police entered shooting at residents, forcing them to flee to the water. 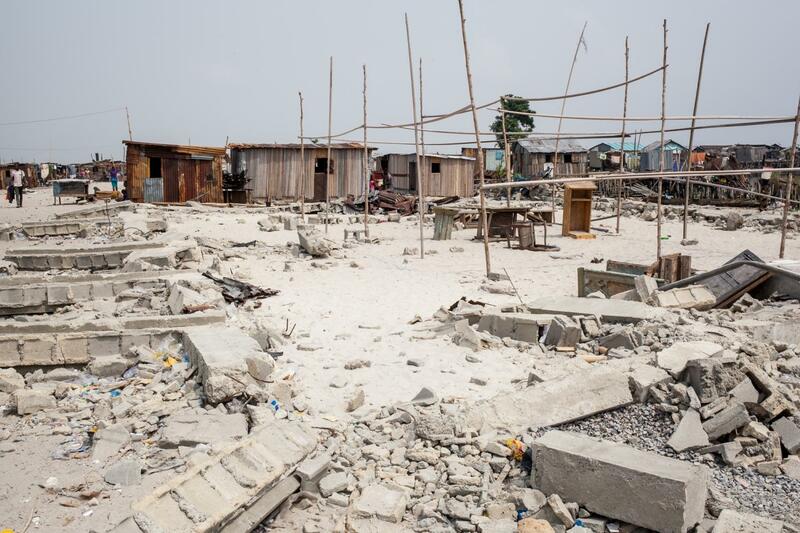 Since then the Lagos High Court ruled the evictions unlawful, and residents began to rebuild, though violent demolitions have continued. 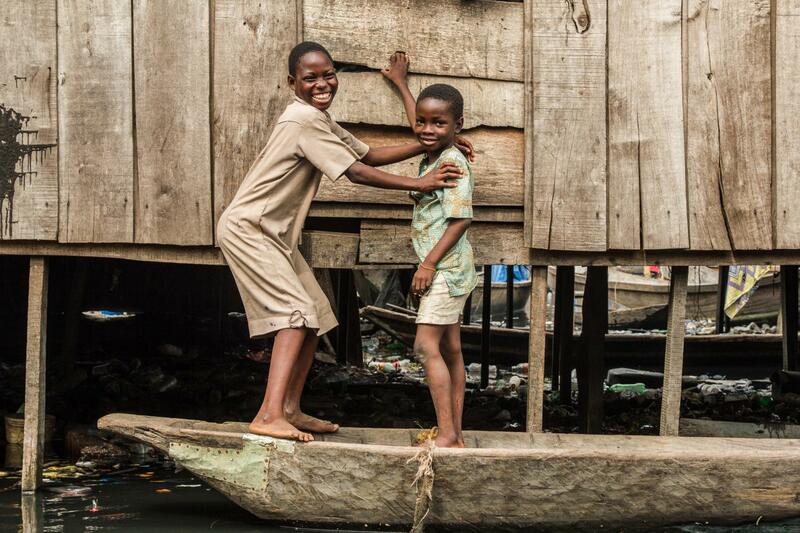 These images document the community of Otodo Gbame following the first evicitons, and Sogunro, another waterfront community that absorbed many of the evictees. 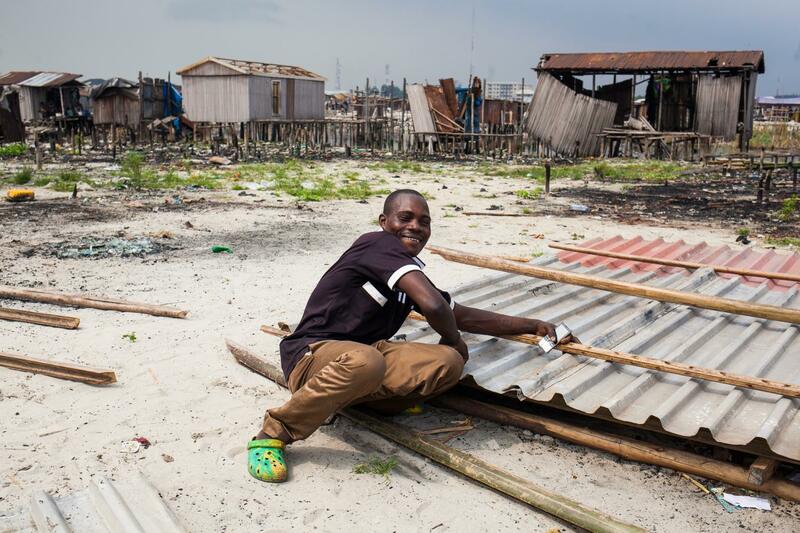 The waterfront communities of Lagos continue the struggle against forced evicitons that cause victims to become refugees in their own city. 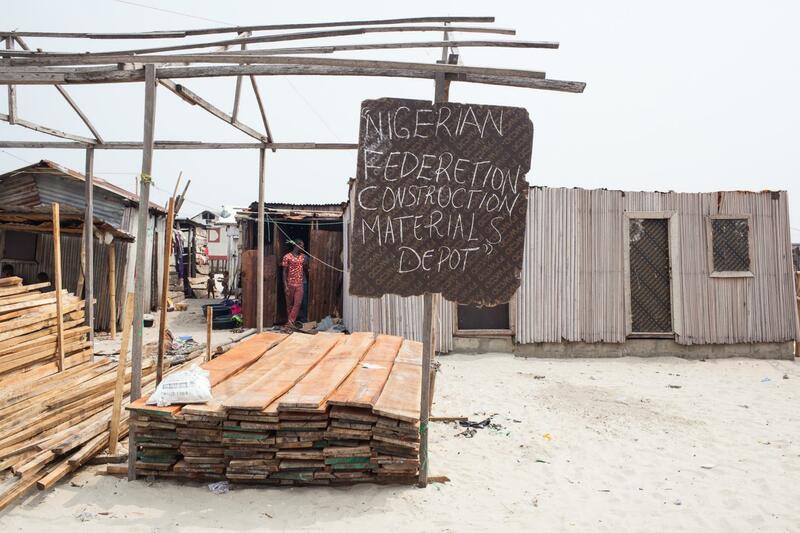 Residents of communities like Sogunro lack security of tenure, and live with the threat of 'land-grabbing' by the Lagos government. 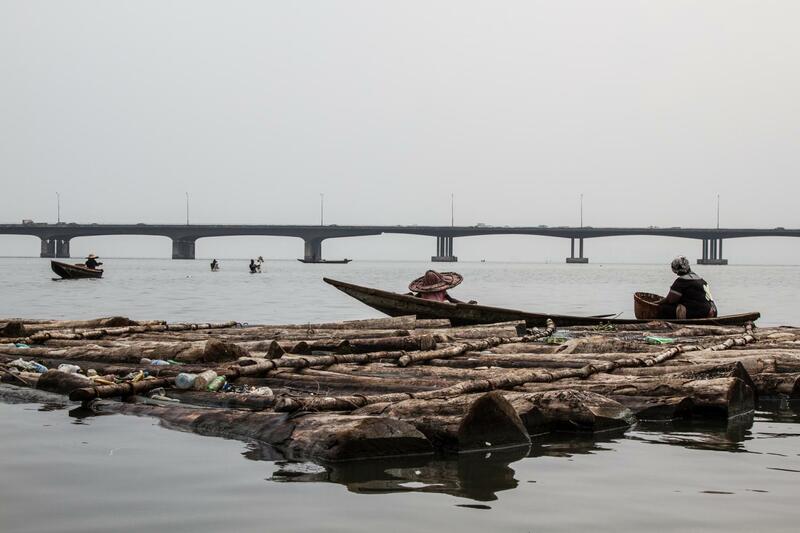 Fishing remains one of the main sources of livelihood for many waterfront communities, such as in Sogunro where fishermen can be seen working in the lagoon with the Third Mainland Bridge in the background. 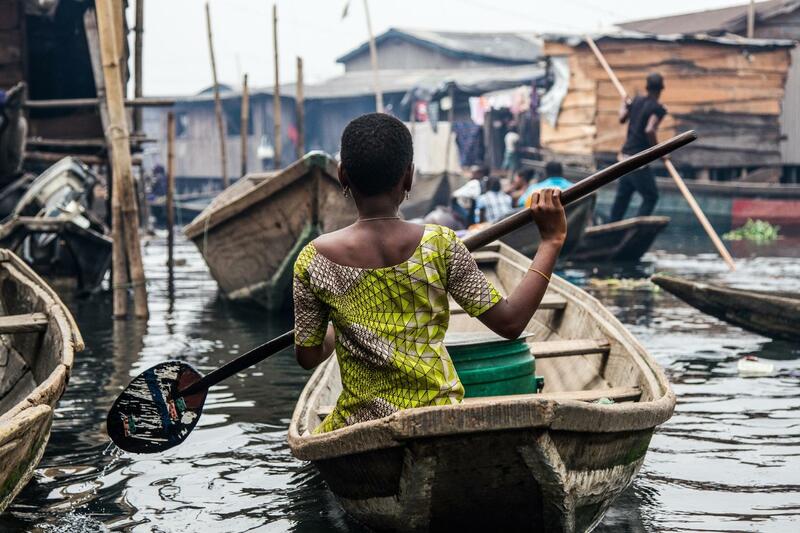 The small fishing community of Otodo Gbame is one of many waterfront settlements in Lagos that is under constant threat of eviction. In November 2016 homes were destroyed and thousands of residents forced to flee. Otodo Gbame sits on a small peninsula with access to water on all sides. 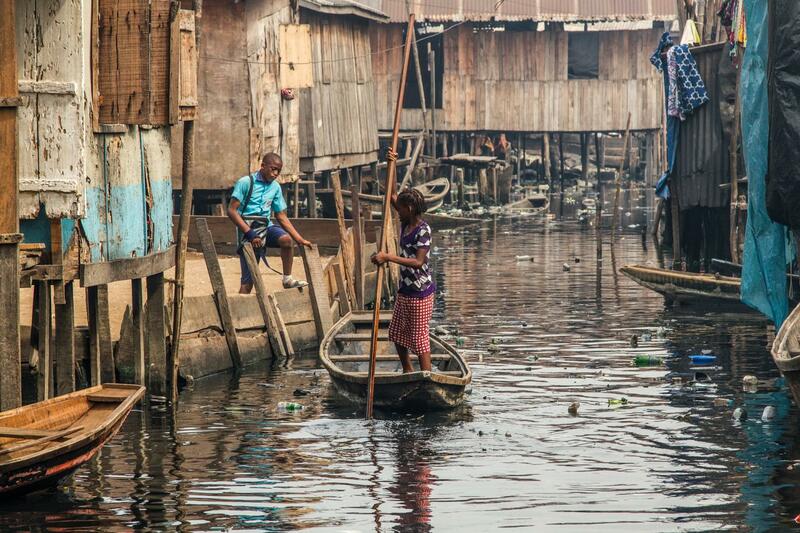 Residents depend on access to the water as their main source of livelihood. 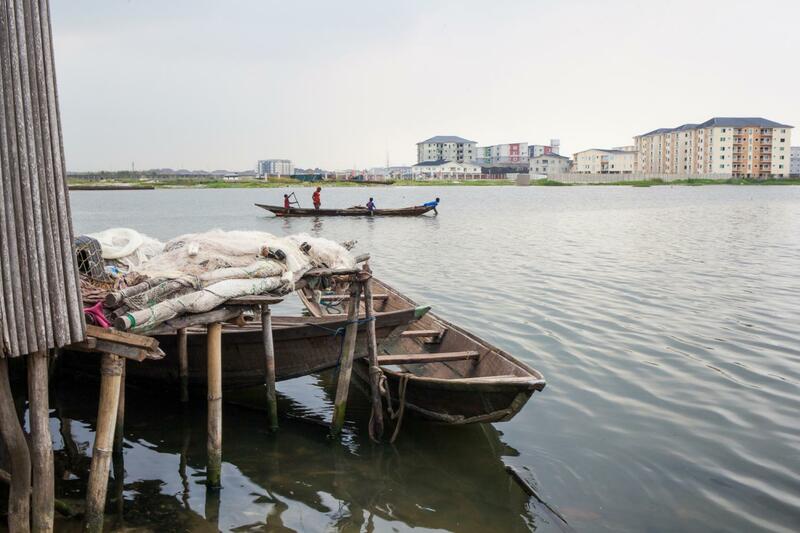 The peninsula is part of Lekki in the south of Lagos. Much of the surrounding land is owned by the powerful Elogushi family. In an attempt to take control of the land occupied by the community, homes were forcibly and unlawful destroyed, displacing thousands. 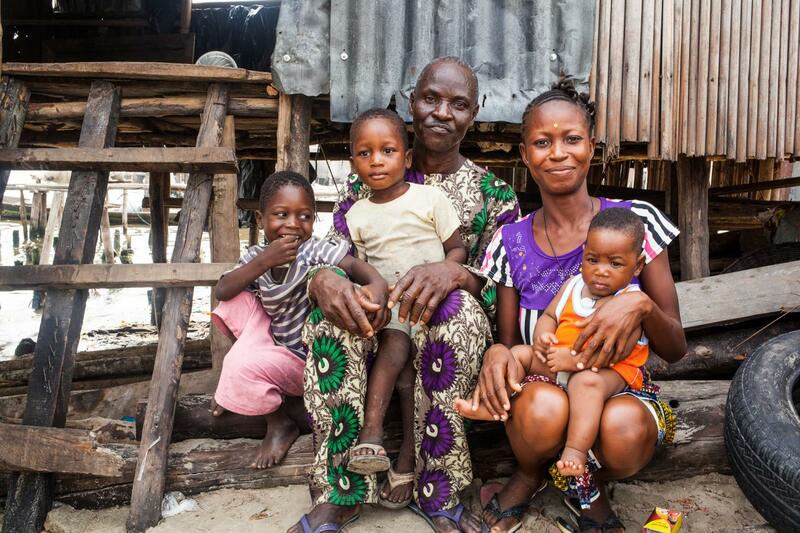 Rosaline Esinsu is a leader in the Celestial Church in Otodo Gbame and also sells smoked fish and is a community leader. 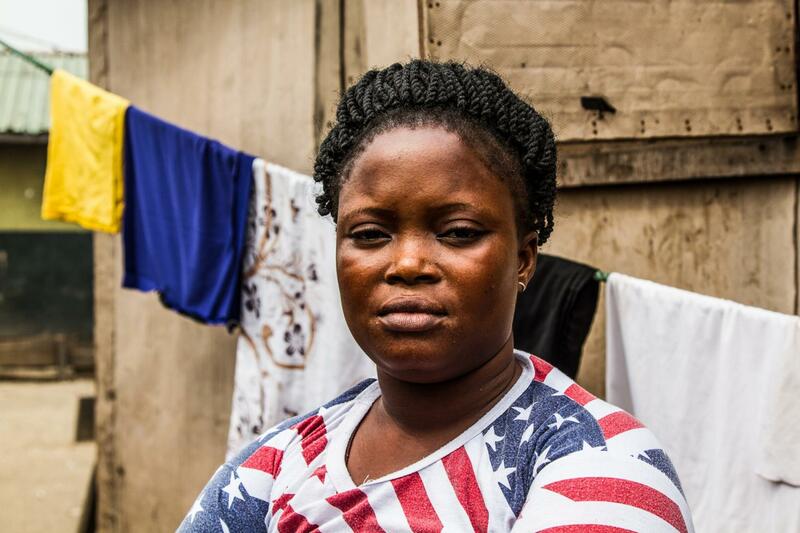 She hasn't seen her husband since he fled into the water following the evictions. 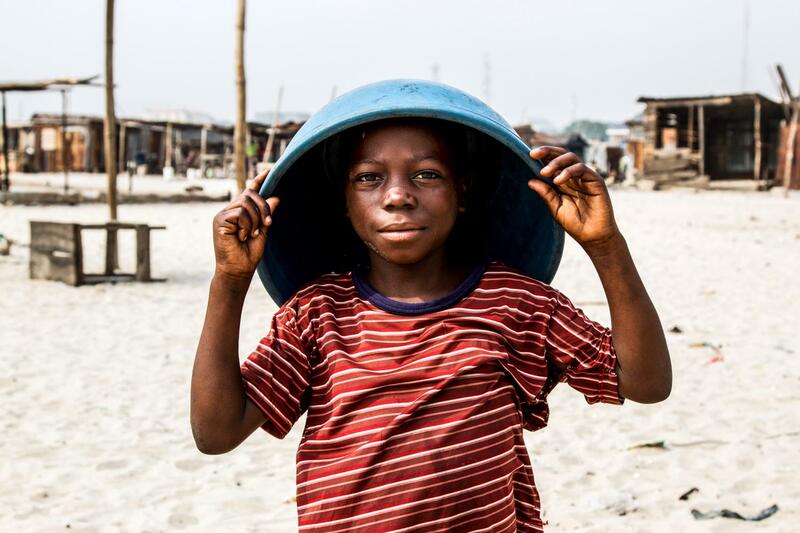 Pascal Torshun, a fisherman and Otodo Gbame elder sold drinking water, and is an active community member. 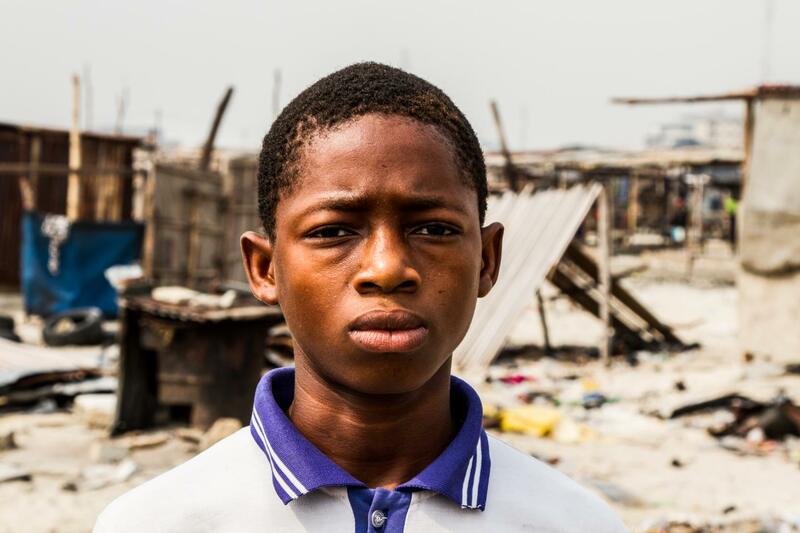 Many students have lost their schools following the violent evictions. Nasu Ahmed recalls how his home and possessions were set on fire, and that he hasn't seen his parents since the evictions. 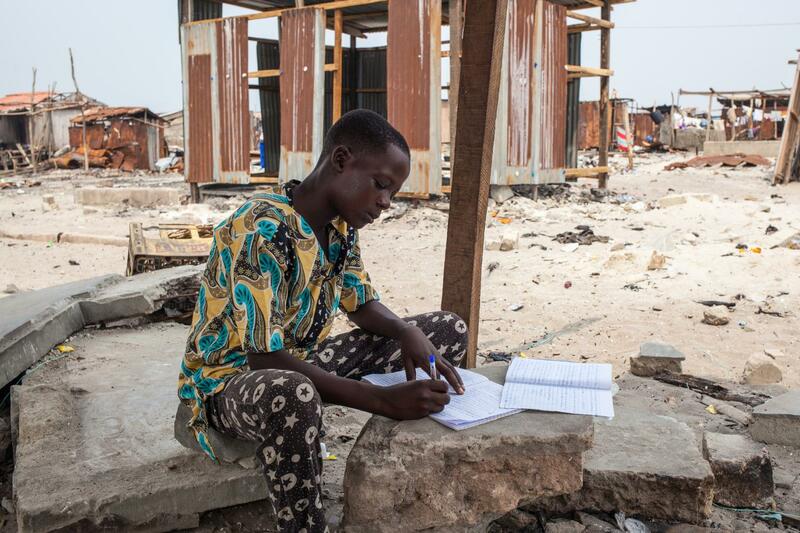 His school books and work were burnt and he no longer has anywhere to study. This razed church is still used as a place of worship. A reverend of a community church. 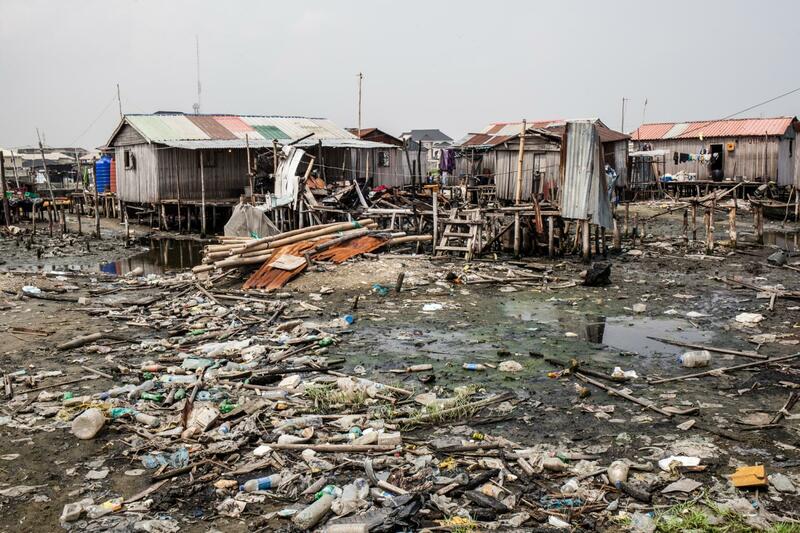 The Nigerian Slum / Informal Settlement Federation is a grassroots movement of the urban poor, that organizes around community-level savings groups and community-led profiling and enumeration to generate data for policy advocacy and planning for community development and slum upgrading. 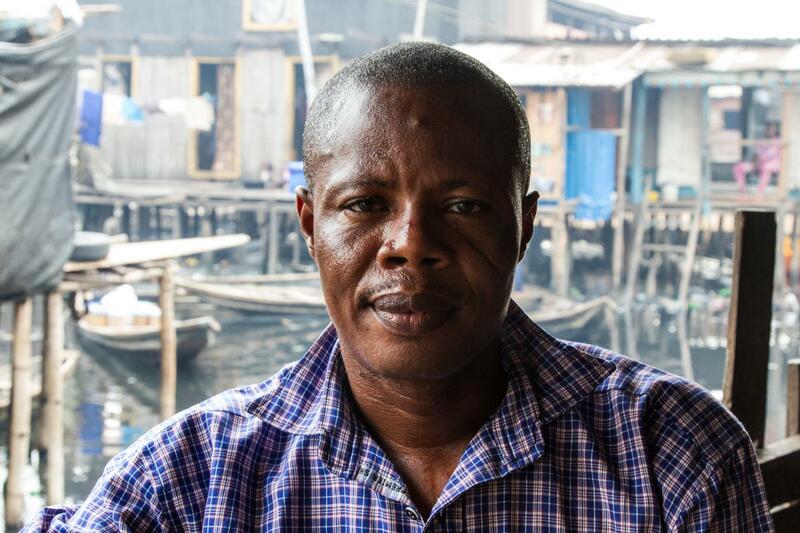 Paul is a Nigerian Slum / Informal Settlement Federation member and one of their many community-based trained para-legals. As a resident of Otodo Gbame, he is helping the struggle for the legal recognition of the right for the community to live on their land. One of the many tasks being undertaken by the Federation is to profile the communities. 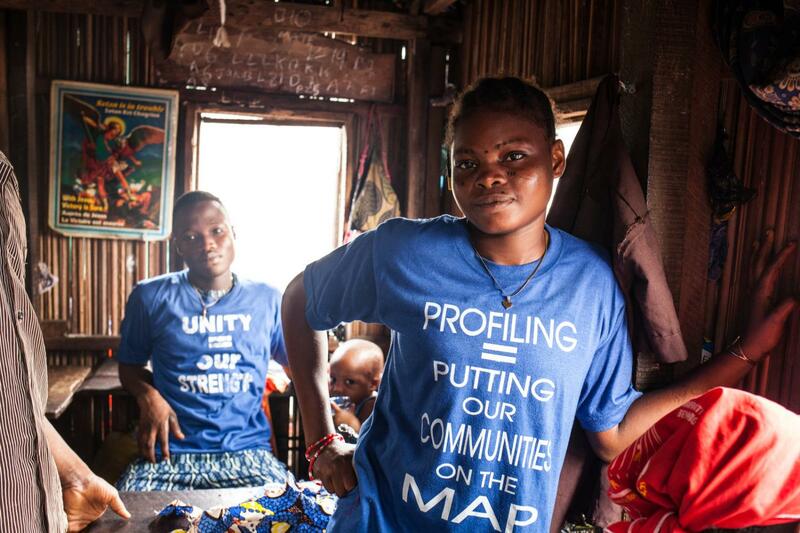 Community profiling, mapping and enumerations gather data that can be used to identify our needs and urban planning solutions. 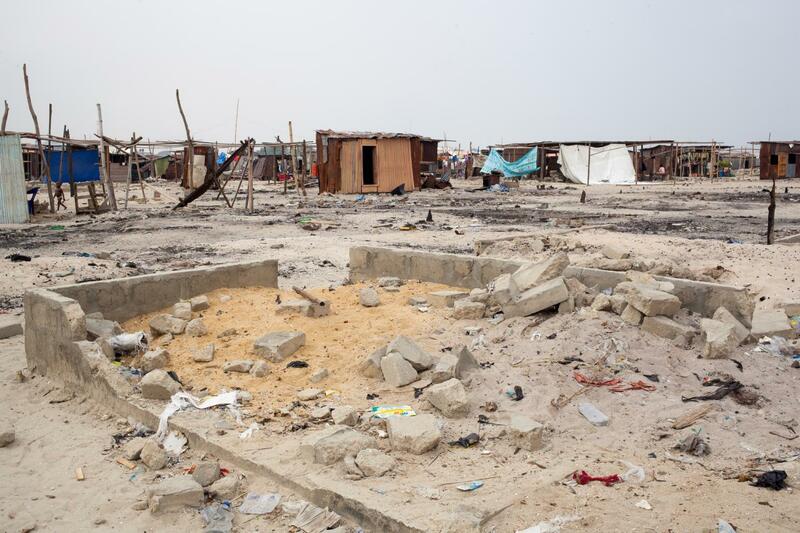 Sogunro, another predominantly Egun community in Lagos accommodated evictees. Agbojete Johnson is the Baale, or 'King', of Sogunro. He was instrumental in sending boats to Otodo Gbame to collect evictees and bring them to Sogunro. "It was terrible", he recounts, "the people really suffered. Even as big as this community is, there is no government hospital. They don't care about us". 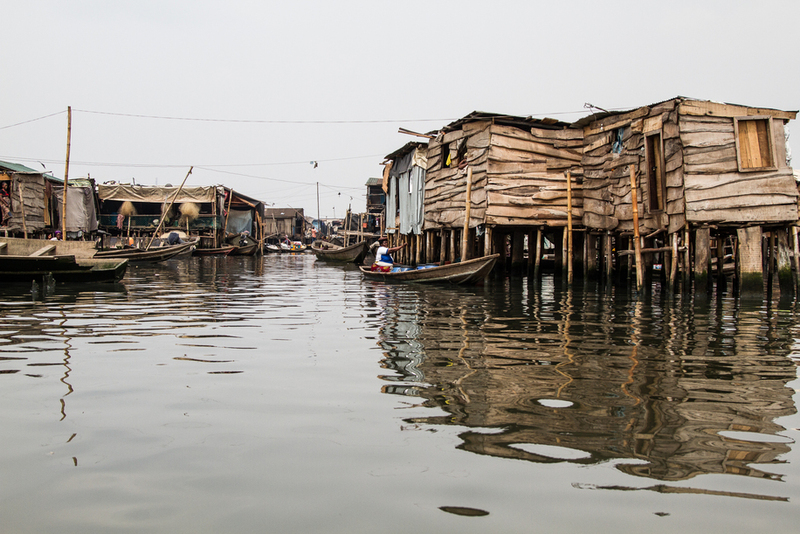 As Sogunro's population grew, houses were built in the water. 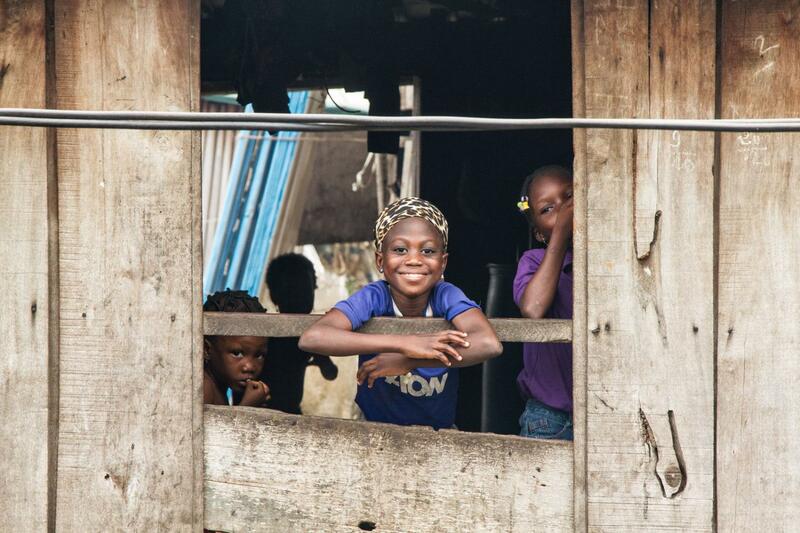 With a lack of space, the community is now dealing with the new residents from Otodo Gbame. 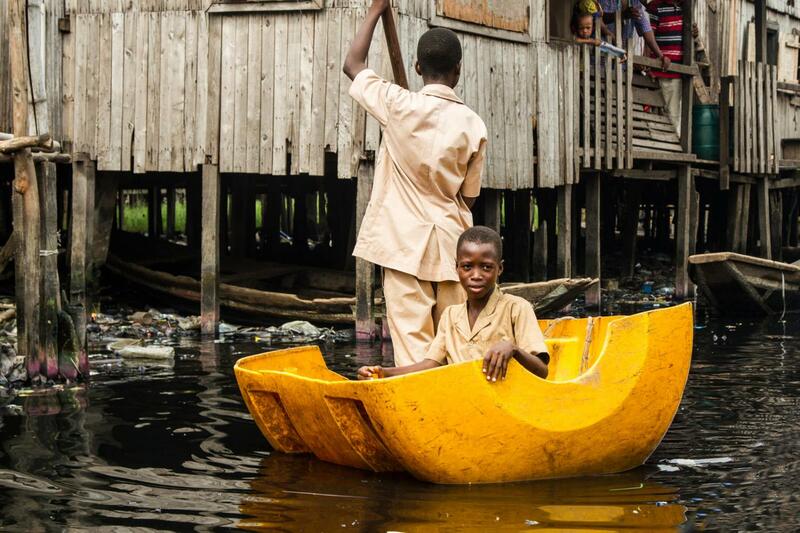 School children commuting through Sogunro. 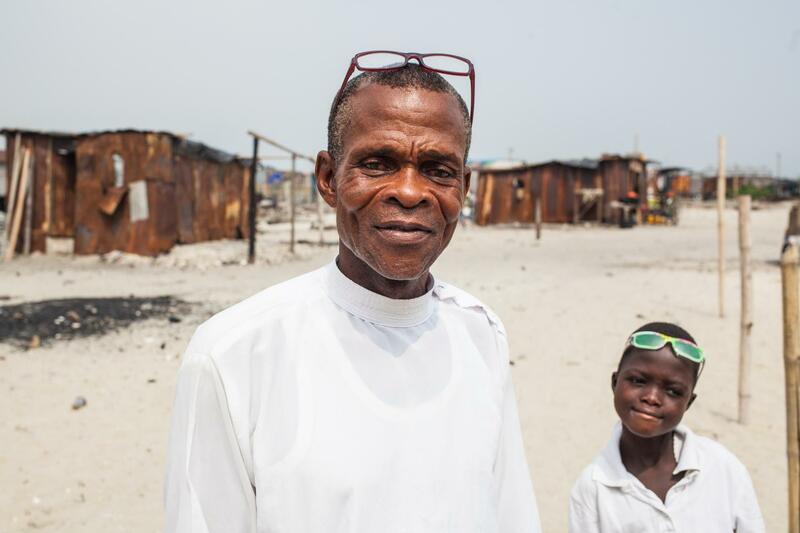 Elenu Dossa, a refugee from Otodo Gbame, remembers being attacked by hoodlums who set the community on fire, shooting sporadically. She says that "now there are too many people living in the rooms where I am squatting. 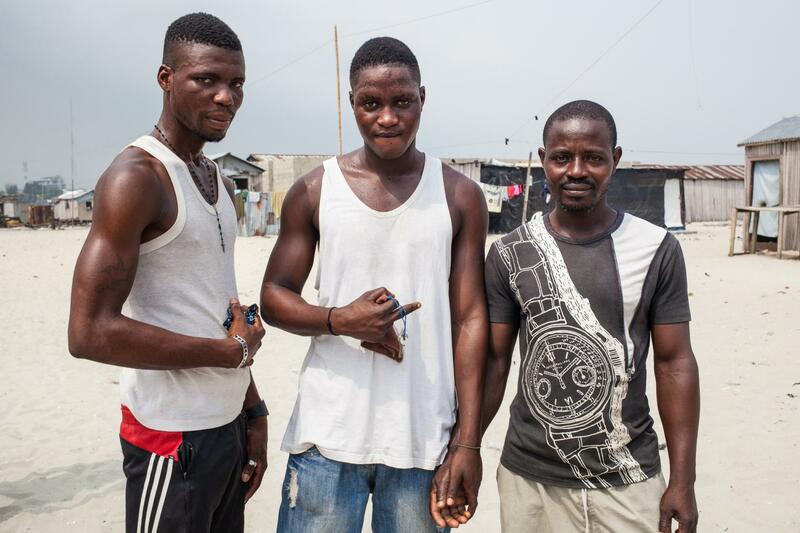 This has caused high temperatures and most of the children are ill. We want the government to help us return home, and to rebuild our houses". 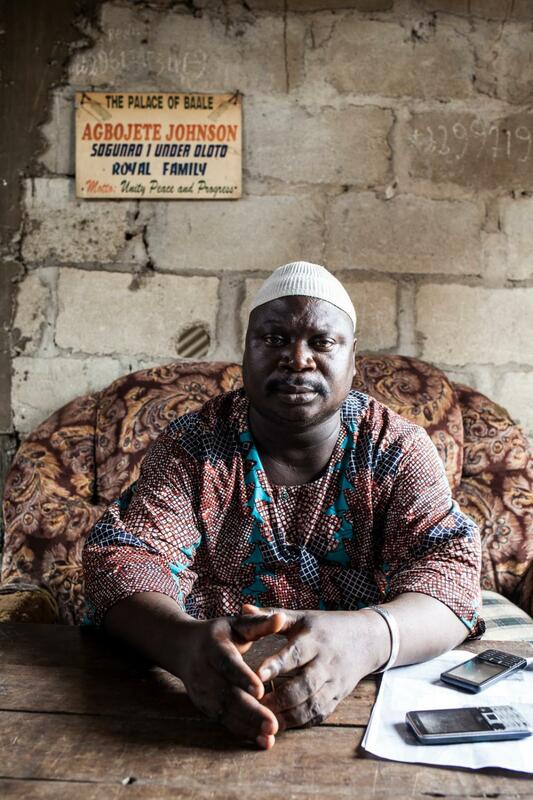 Gerard Avlessi is a community leader in Sogunro. 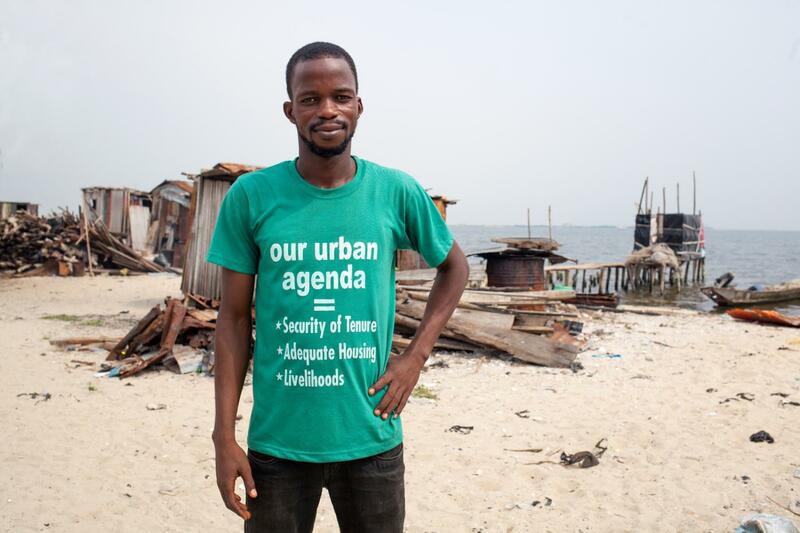 He is also a member of the Nigerian Slum / Informal Settlement Federation, and has been involved in Federation activities for the last few years. 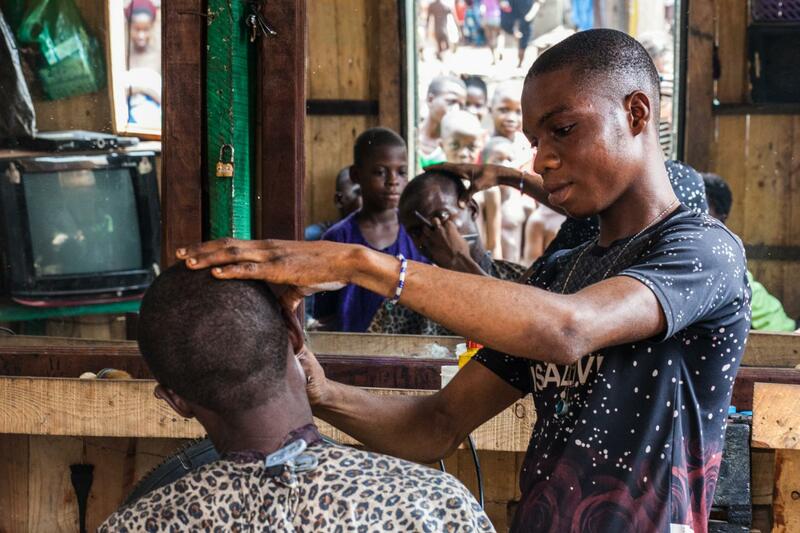 He and a few others have been leading the outreach to other Egun communities in Cotonou, Benin. 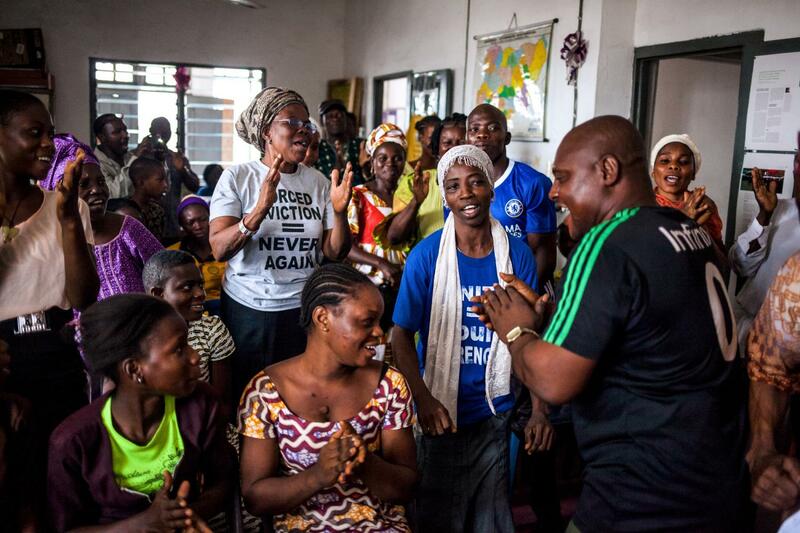 Gerard accommodated evictees from Otodo Gbame. 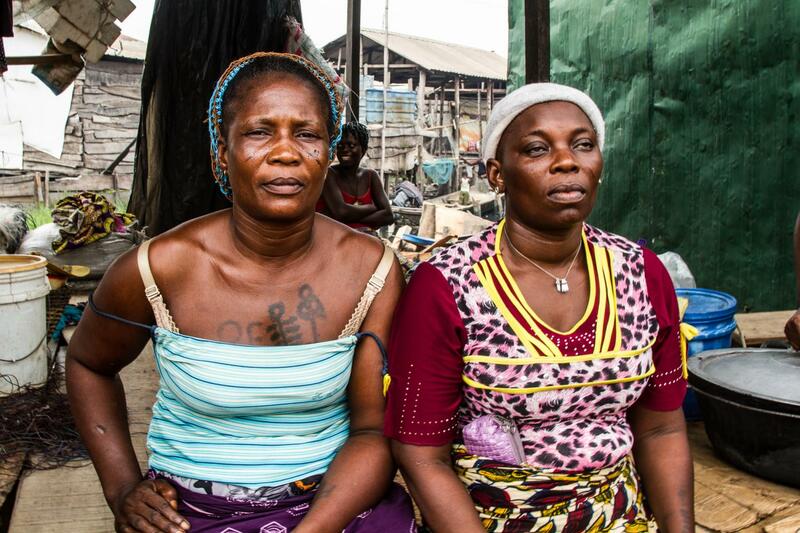 Janet Azindji (left) accommodated twenty people from Otodo Gbame, including eight children. One of the evictees taken in by Janet is Veronica Agbogla (right). 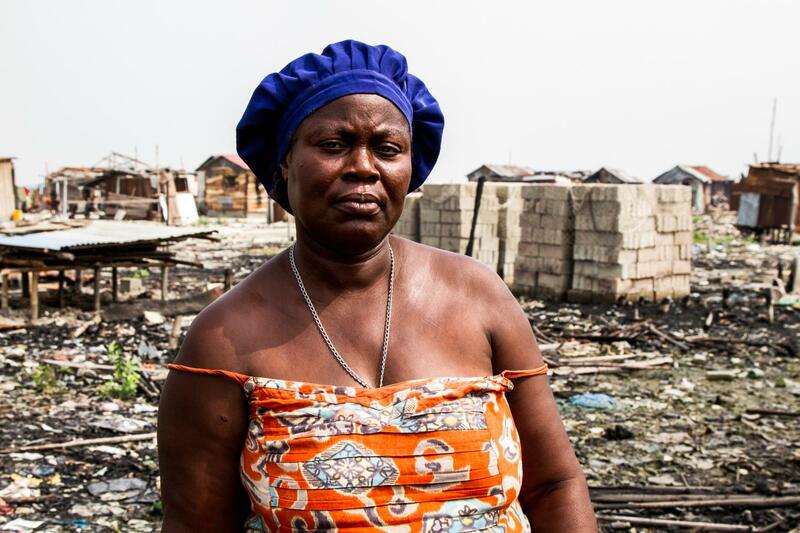 Veronica was blinded by the fires that were lit during the brutal evictions. "I lost my house, all my property, and everything I have laboured for". 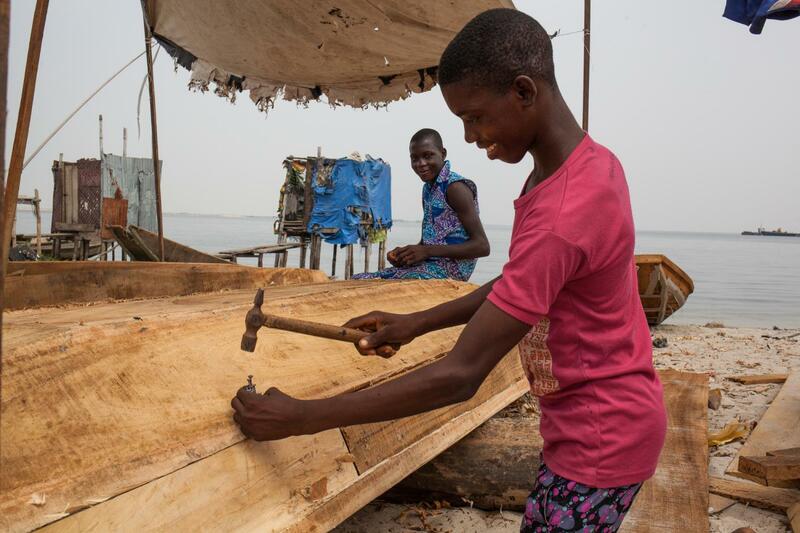 Following a ruling from the Lagos High Court that ruled that the waterfront evictions are cruel, inhuman and degrading treatment, residents returned, and rebuilding began. 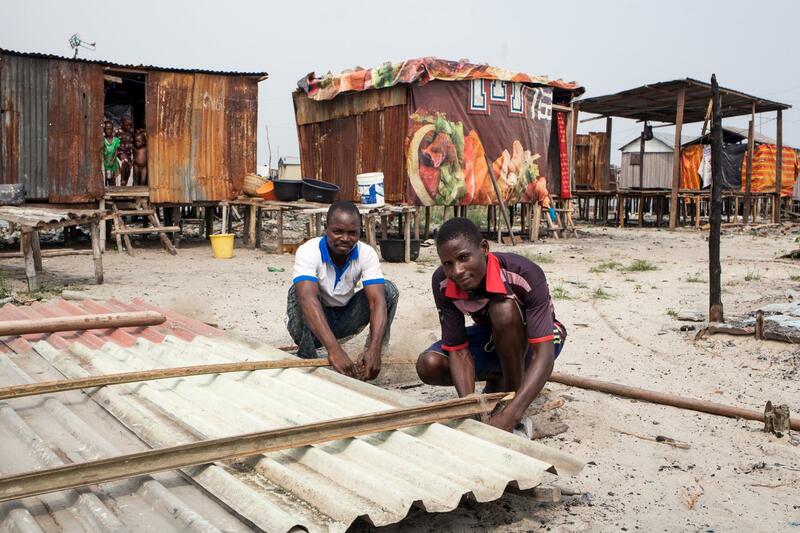 Residents soon began rebuilding their homes. Beside razed buildings, new homes emerge. 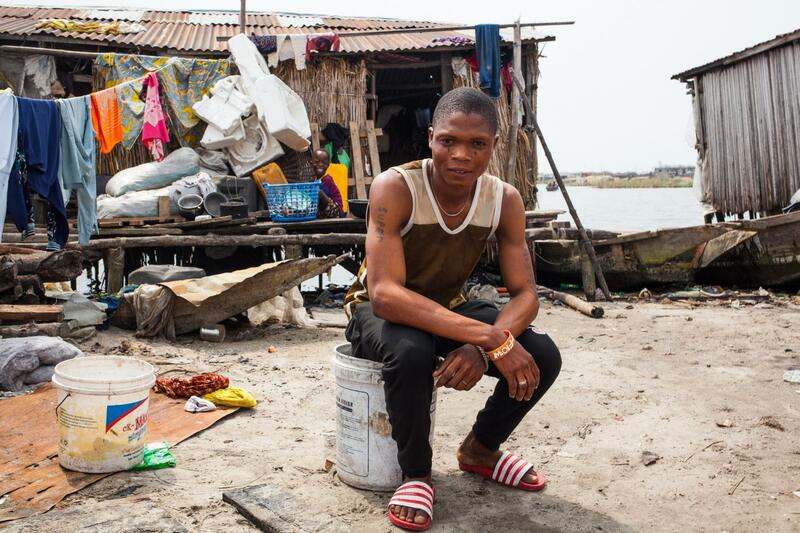 While many evictees from Otodo Gbame have begun returning to rebuild their community, the future of all waterfront settlements in Lagos is faced with uncertainty. 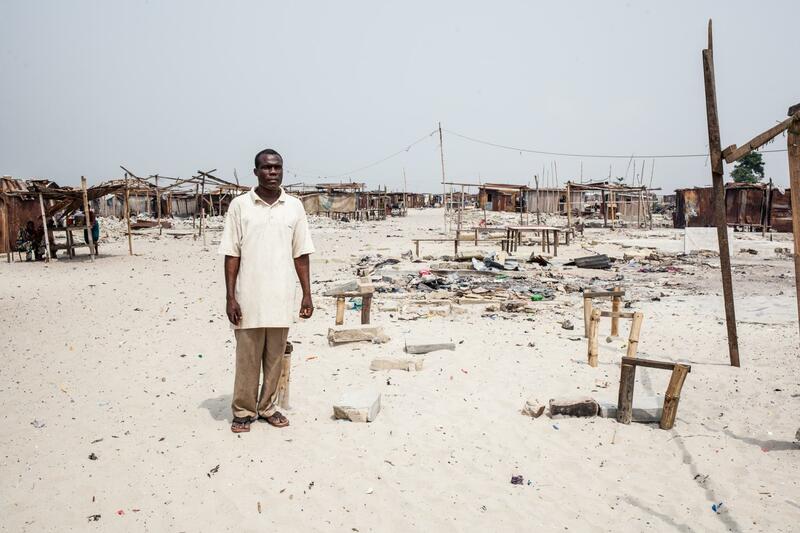 Since these photographs were taken, further forced evictions have taken place in the community. With security of tenure lacking, what can be done to ensure thousands more residents don't become refugees in their own city?